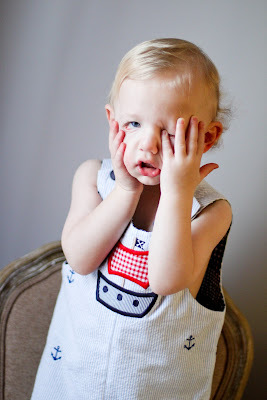 I Love You More Than Carrots: My Grey Hairs Are A Direct Correlation To These 3 Toddler-isms. My Grey Hairs Are A Direct Correlation To These 3 Toddler-isms. Today you can find me guest-posting over at Laura's blog My Thoughts-Uninterrupted about my three, count 'em, THREE grey hairs and watch as I speculate just how I may have gotten them. After all, I blame The Toddler. Needless to say if The Toddler keeps these behaviors up, I will be fully grey by the time he reaches pre-school. And let's not even talk about puberty. Be sure to head on over to her blog and check out just what I had to say! AMEN! Easton would eat ANYTHING up until about a month ago. Now we do good to get anything down the hatch. What gives?!?!!? I found my first gray hair in my early 20's. And now, at the ripe old age of 31, I have to say, finding a gray hair in *other* places is much more devastating. (and if anyone doesn't get that *other* reference, lets just say the carpet is starting to match the drapes) So, while my "upper grays" will continued to be camouflaged on a regular basis, the "lowers" will only be known to myself, my husband, and - oops - now the internet! I LOVE that picture of Carter! Tommy always screams NO and puts his hand up as if I'm a paparazzi instead of his mother trying to get a cute picture!